Citizens UK is an alliance of civil society groups, such as churches, mosques, unions and schools, who commit to working together for the benefit of their local communities. A number of faith groups, having worked with Citizens UK in other South London Boroughs have formed Merton Citizens. For more information about Citizens UK and Merton Citizens please follow the link http://www.citizensuk.org. 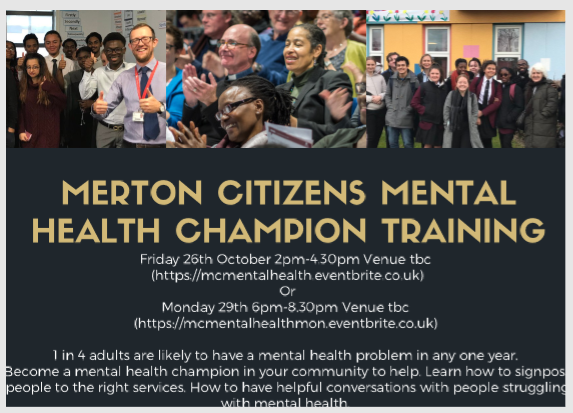 Merton Citizens is organising mental health training on October 26th and 29th of 2018. For more details, please follow this link.